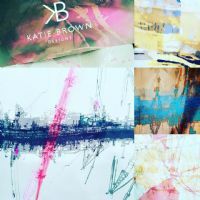 Katie Brown is an award winning textile designer who has a specialized range of printed silk scarves. Prints are all based on her original drawings and urban landscape photography. Swirling barbed wire and skeletal cranes are some of the hallmarks of her work, which she develops from her Belfast studio. Hand and digital techniques are used before the scarves go for final printing using ‘state of the art’ equipment.